More than any of his predecessors, and more than any other Irish immigrant to Newfoundland in the 18th or 19th centuries, the Franciscan priest and bishop Michael Anthony Fleming was a religious, social, political, and cultural agent and broker for the Irish in Newfoundland. His period in office saw a remarkable development in the institutional Roman Catholic Church, and the advancement of the social, legal, and political place of the Irish in Newfoundland society. Where his predecessor bishops hesitated, he took decisive action; where others were retiring, he seized the moment; where others shunned controversy, he embraced it. 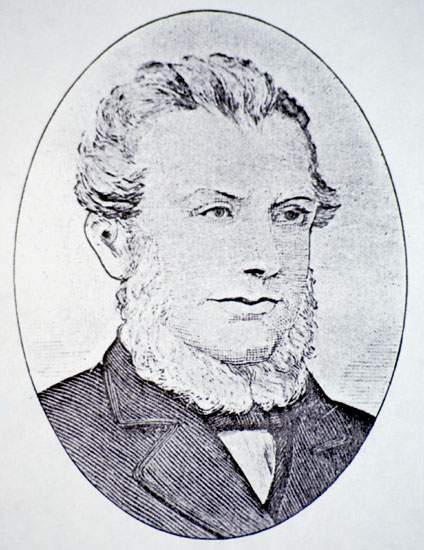 Much of what he accomplished helped to turn Irish and other British immigrants into Newfoundlanders, and he became one of the most important Newfoundlanders who lived in the nineteenth century. 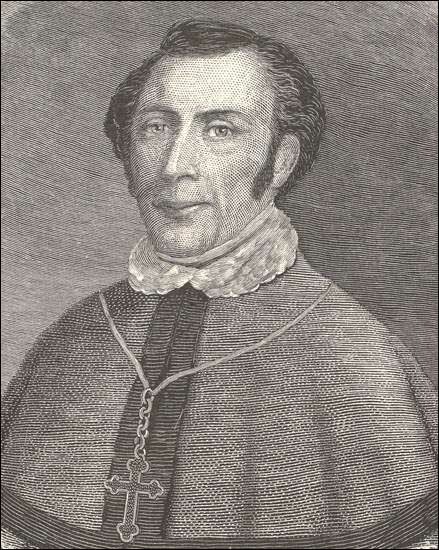 Bishop Michael Anthony Fleming (1792-1850), n.d. Forth Roman Catholic bishop of St. John's. Fleming came to work as a priest in St. John's in 1823. He was consecrated coadjustor bishop in the Chapel in St. John's in 1829. Michael Anthony Fleming was born in 1792 about "three miles from Carrick [in County Tipperary] and ten from Waterford", most likely near Piltown, County Kilkenny. As a boy, Fleming studied the classics for two years at Stradbally, Co. Waterford, under the tutelage of the Parson Foley, "a Protestant clergyman of the most orthodox character", and then finished his studies at the Protestant grammar school at Clonmel. His uncle Fr. Martin Fleming encouraged him to enter the religious life, and the young Fleming was admitted to the Franciscan seminary at Wexford, where his professors were Thomas Scallan, whom he later succeeded as bishop in St. John's, Henry Hughes, who later became Bishop of Gibraltar, and Richard Hayes, who was a close friend of the Irish politician and campaigner, Daniel O'Connell. 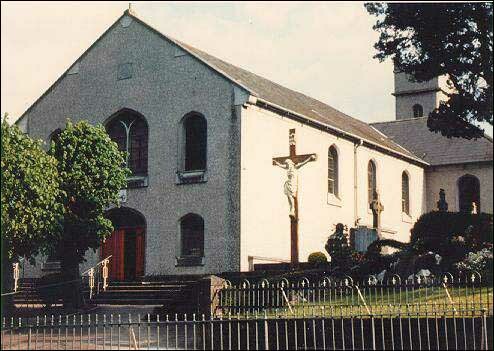 Fleming was ordained on 15 October 1815 and assigned to his uncle's friary at Carrickbeg. His experience in helping his uncle to rebuild the Franciscan chapel there marked him at an early age as a "builder", and stood him in good stead for his later work in Newfoundland. After Fleming was ordained in October 1815, he was assigned to this friary. Photo by J.E. FitzGerald. Reproduced by permission of J.E. FitzGerald, ©2001. In 1823, at the invitation of Bishop Thomas Scallan and Benevolent Irish Society member Henry Shea, Fleming was recruited to come and work as a priest in St. John's. From the outset, Fleming proved to be of a very different temperament from Scallan. His ideas about the place of the Irish and Roman Catholicism in Newfoundland were informed by his experience of Daniel O'Connell's nationalist politics in Ireland, and his adherence to ultramontanism, the tendency for European Roman Catholic clergy to try to insulate the Church from political control or influence by looking over the Alps to the papacy in Rome for teaching, doctrine, leadership, and cultural models. From experience in Ireland, Fleming believed that lay trustees should not be involved in the temporal affairs of the Church, particularly in finances, since this led to division among the congregation and a lack of respect for the clergy. In St. John's he saw that Scallan allowed the affairs of the Old Chapel to be managed by a Chapel Committee, which included many of the same people (such as Timothy Hogan. Michael McLean Little, and Patrick Kough) who were prominent in the Benevolent Irish Society, who kept the BIS's Orphan Asylum School officially non-denominational, and who also had close social ties to the establishment at Government House. Furthermore, Scallan's "liberality" towards Protestants scandalized the conservative Fleming. While these deferential "Liberal" Catholics (as Fleming later called them in his correspondence with Rome) derived a measure of social prestige and status from their connections, Catholics remained excluded from the governor's council, and were still required to pay fees to the Anglican clergy for marriages and burials, and since representative government still did not exist in Newfoundland, they remained disenfranchised along with the rest of the population. "Newfoundland," he wrote, was "a country where the executive power was exclusively Protestant and all the offices dependent on the governor from top to bottom were occupied almost exclusively by Protestants." These things Fleming was determined to change. Soon after he was consecrated coadjutor bishop in the Chapel in St. John's in 1829, Fleming implemented his ultramontane ideology. He disbanded the Chapel Committee, "took charge" of the management of the Orphan Asylum School and introduced the teaching of the Catholic catechism there. He also embarked on a systematic expansion of institutional Catholicism in Newfoundland. This included the construction of new parish churches, the subdivision of existing parishes into new parishes, the recruitment of Irish priests, and the introduction of two religious orders of Irish women - the Presentation sisters in 1833, and the Sisters of Mercy in 1842 - to teach young female children, and to help create a Catholic middle class capable of wielding influence. 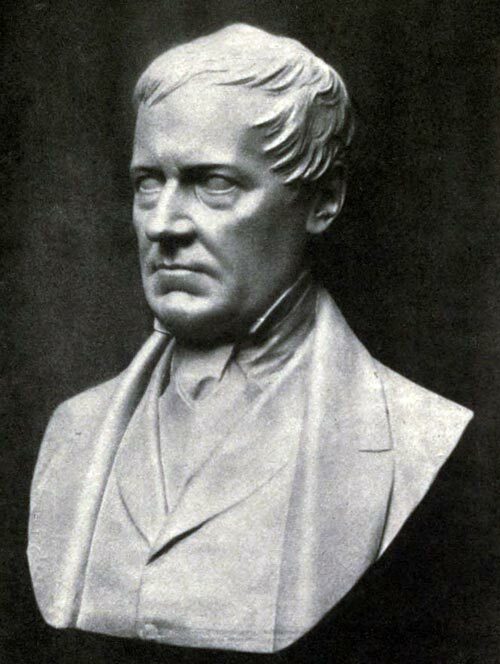 In 1832, during the fall election of the first House of Assembly, Fleming openly became involved in electoral politics when he announced his support for John Kent, a young Irish candidate, as well as his support for William Carson and William Thomas, all Reform candidates. Kent had previously been denounced by Henry Winton, the editor of the Tory newspaper The Public Ledger, and Fleming replied in the press that he had every right to as a citizen to his views. Winton then attacked Fleming in the press, advising Fleming to recant. This exchange initiated a strident and rancorous dispute between Reformers and Tories that endured for the next decade and a half, which itself earned a reputation for the new Newfoundland House of Assembly in the London newspapers as the "Bow-Wow Parliament". Kent, who was married Fleming's sister Johnanna, was a candidate for the first House of Assembly and was supported by Fleming. Artist unknown. From Benevolent Irish Society (St. John's, NL), Benevolent Irish Society of St. John's, NL, 1806-1906 (Guy & Co., 1906) 124. Fleming attracted a good deal of political support for Catholic causes because he both supported, and enjoyed the support of a dedicated cadre of Reformers. These included John Valentine Nugent (the chief political advisor, after 1833, of the Reformers); Patrick Morris, a substantial merchant; Morris's nephew, Kent (who married Fleming's sister Johnanna in 1834), and William Carson. Fleming enjoyed tremendous personal popularity among ordinary citizens, including many Protestants, and particularly among his Irish congregations, who welcomed his O'Connellite approach to politics, and the denunciation of his opponents as "Mad Dogs" or "Orange Catholics" - O'Connellite terms for Catholics who did not support O'Connell's politics. Fleming asserted Catholic rights but he also stood for the rights of other denominations, and for basic human rights. One of the first petitions presented in the new House of Assembly came from Fleming, asking that Methodists might not be legally compelled to solemnize marriages according to the rites of the Church of England. He took pains to visit outport Newfoundland, and during the winter of 1835 lived in a fishing room at Petty Harbour, administering smallpox vaccine to the whole community of Catholics and Anglicans, and remaining in quarantine with them when no physician or other clergyman would go there. Despite Fleming's tireless pastoral work, he and the Reformers continued to work together in politics. They made bitter enemies of the Tories and the former "Liberal" Catholics, especially after the election of 1836, when the Reformers dominated the House of Assembly. The Tories and Liberal Catholics vigorously lobbied the Colonial Office in London to revoke the grant of representative government, and to have Rome remove Fleming from Newfoundland. They were aided by the Augustinian priest Timothy Browne, who was older than Fleming and was jealous that he had not been appointed bishop. They were also aided by the behaviour of Fleming's curate in St. John's, the priest Edward Troy, who was prone to political outbursts during Fleming's frequent absences, and who was the principal cause of political discontent. The Tories believed - with some justice - that Troy should have kept on a shorter leash. For the reformers' defense, Fleming recruited the support of O'Connell, who frequently advocated Newfoundland causes and countered the Newfoundland Tories' criticisms in the British House of Commons. Fleming's greatest domestic projects, the ones for which he became best remembered, were the recruiting of two orders of Irish religious women to work as teachers, and the construction of a new cathedral for St. John's. In 1833 at Fleming's request, the Sisters of the Presentation of the Blessed Virgin came to Newfoundland from Galway and opened a school for children in rented premises, the former Tavern of the Rising Sun. Within weeks the sisters were inundated with new pupils, the children of the Irish of St. John's, who saw education as the best means of economic and social advancement. In 1842, Fleming invited the Sisters of Mercy to come to teach girls and to help create a Catholic middle class. Through Fleming's influence, the Education Act of 1836 introduced the precedent of granting state funds to denominations for educational purposes. Through the 1830s, Fleming pursued a grant of land on which to build a cathedral. By 1838 the land was awarded, and construction began, continuing until 1855. 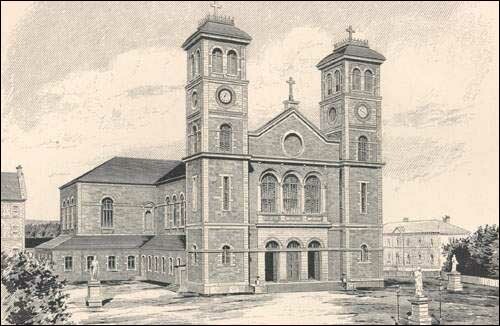 The cathedral was the largest building project in 19th century Newfoundland, and thereafter became the definitive icon of Newfoundland Roman Catholicism. Fleming was responsible for the construction of the Cathedral, which was completed in 1855. It was the biggest construction project in Newfoundland in that century. Drawning by Lewis Eng. Co. Boston. From M.F. Howley, Ecclesiastical History of Newfoundland (Boston: Doyle and Whittle, 1888) 352. Despite the expansion of the institutional Church, Newfoundland politics reached a breaking point by 1840, after a particularly violent by-election involving reformers in Conception Bay. Encouraged by officials at Government House, McLean Little and Hogan frequently wrote the governor and London complaining about the conduct of Fleming and his priests, and their friends the Reformers. At the Colonial Office in London, the Under-Secretary of State for the Colonies and the man responsible for Newfoundland, Sir James Stephen, was deluged with complaints. It was decided that a Parliamentary Committee would investigate Newfoundland affairs and make recommendations, and by 1843 this process culminated in the amalgamation of the House of Assembly with the Legislative Council. Stephen was the Under-Secretary of State for the Colonies at the Colonial Office in London and was responsible for Newfoundland. The British Government also secretly broke its own laws which prohibited its ministers from engaging in diplomatic relations with the Vatican, and forwarded these complaints to Rome in an attempt to discredit Fleming and have him removed from Newfoundland. Fleming found out about the accusations and in his replies to Rome he claimed innocence while cannily denouncing his detractors as "Liberals", a description which meant one thing in Newfoundland, but which meant something quite different to the Italian cardinals at the Vatican, who envisaged Liberal Freemasons dedicated to bloody revolution. In November 1840 Pope Gregory XVI ordered Fleming to banish the priest Edward Troy from Newfoundland - Fleming sent him to Merasheen Island in Placentia Bay - and summoned Fleming to Rome to explain himself. While Fleming kept sending vigorous defences of himself, remarkably, he claimed never to have received the summons. Even more remarkably, Rome let the issue drop and continued to fund the construction of Fleming's cathedral. Thereafter Fleming occupied himself day and night with the construction of his cathedral in St. John's, reconciled himself with many of his former political adversaries, and warded-off a late (1848) attempt to annex the Newfoundland Church to the jurisdiction of the Archbishopric of Québec. Fleming was so determined to celebrate the first mass in his new cathedral on Old Christmas Day, 6 January 1850 that he turned out in the middle of a snowstorm, in failing health, to do so. 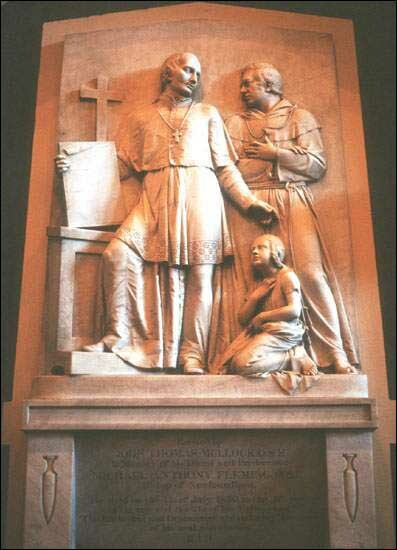 He died on 12 July 1850 at St. Michael's Convent (monastery), Belvedere. After the largest funeral ever seen in Newfoundland, he was buried in the crypt of his cathedral. Mullock succeeded Fleming as Bishop of St. John's Mullock succeeded Fleming as Bishop of St. John's. Without a doubt, Fleming was the most controversial of all the Newfoundland Roman Catholic bishops, and his dogmatism and confrontational style perpetuated a number of the conflicts between the Irish Catholics and British Protestants in Newfoundland. But Fleming was also the bishop who effected the most change upon Newfoundland society. None of his predecessors had the international connections which Fleming did, none could have built the St. John's cathedral, none had the vision to recruit religious orders of Irish women to educate children in an attempt to create a native middle class, and none began to see Newfoundland - for all the things Irish he imported - less as an Irish colony, and more as its own country. The changes he wrought on institutional Roman Catholicism were profound, and he was principally responsible for changing a small mission with several priests in four parishes into a large diocese with over 40,000 congregants. For these reasons Fleming was the single most influential Irish immigrant to come to Newfoundland in the 19th century.